Artificial Ice Events understands the importance of all school fundraising activities and the impact they have on student events, sports programs, and enrichment activities. An already special event by definition, a school fundraising can be turned into a gala event with the addition of our synthetic ice rink designs and all the trimmings. Your school may hold a Skate-a-thon which are much like the dance marathons of old. Sponsors pay the skater per hour or mile of ice skating to raise funds for your organization. Sponsor a dazzling ice event with ice skating stars and graceful dance pairs. Proceeds of your ticket sales go to your next school trip or to fund Prom Night. Support the cause by bringing the magic of skating alive. Invite friends and family to a Skate Under the Stars night to sponsor the Senior Trip. Keep it all hassle-free with our eco-friendly and easy-maintenance synthetic ice rinks. 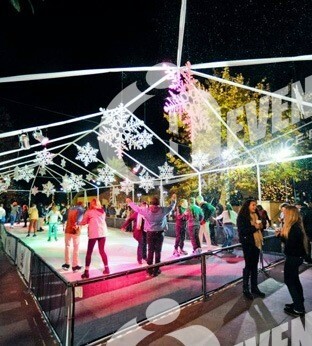 A wonderful addition to any special event, ice skating rinks are perfectly fit for indoor or outdoor use during all seasons and in all climates, equally at home for school events in San Antonio, Texas or Orlando, Florida or Chicago, Illinois. Evoking the extraordinary feeling of skating on a real frozen lake or stream, synthetic ice rinks offer great cost savings compared to refrigerated ice. Create a Ballet on Ice with the perfect winter scenery instead of staging the same traditional School Play. Complement your school fundraising event by inviting everyone to donate for your cause and have fun while doing it.